Ann Taylor may be better known as your mother's favourite store than your own, but thanks to a new campaign, it looks set to become a fashion destination for those in their twenties too. The Style For Students online lookbook takes its lead from street style blogs like Scott Schumann's Sartorialist and Jak and Jill, featuring girls from universities across the U.S. wearing the label's latest collections. Each photo is accompanied by a short description of each girl, describing her career goals and approach to personal style. Visitors to the site can then 'like' their favourites, as they might a Facebook post, and by doing so, be entered to win $500 worth of merchandise. Already there are a few clear favourites. Corinna, who is studying International Affairs and Global Public Health at George Washington University already has 818 'likes' for her white shirt, black pencil skirt and fur stole. Nimisha, from the same college, is not far behind with 801 votes for her nautical-inspired white trousers and royal blue top. Other, newer additions to the site, look set to rival them though. 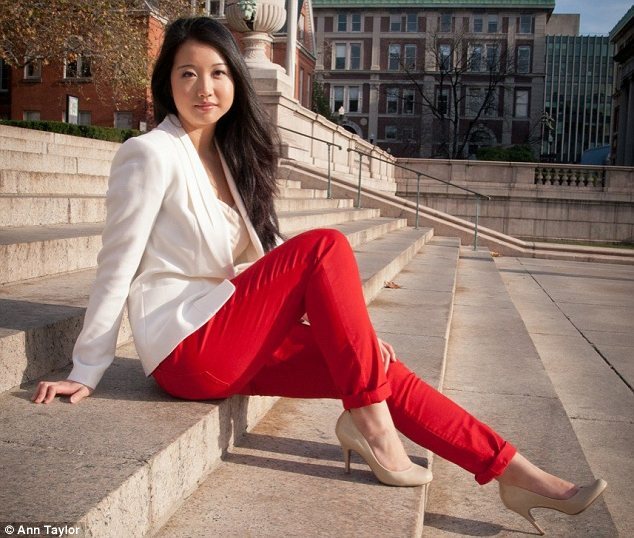 Claire, from Columbia University, only has 40 votes, but with her Isabel Marant-alike red jeans and crisp white Stella-style blazer, that number looks set to soar. The same is true of Meltem, or the University of Chicago, whose sartorial savvy is demonstrated in the way she wears a skinny belt with her roll-neck tank. The idea is promising to be even more effective at capturing the attention of a cool, more fashion-conscious market than its high-profile ad campaigns starring Demi Moore and Katie Holmes. The images of real girls - of all shapes and sizes - prove that Ann Taylor designs can be as relevant to the younger generation as they are to its more typically middle-aged customer. And while tailored shirts and heels may not be their typical lecture attire, the girls featured know that they will have to learn how to smarten up when they start on the interview circuit next year. Fellow U of K student Tess is equally aware of the importance of dressing to impress.